1 X BOXED NEGAN FUNKO POCKET POP KEYCHAIN. Funko Pop Vinyl - THE WALKING DEAD - Abraham #309 - BOXED AND IMMACULATE! ABRAHAM #309. THEY HAVE BEEN OUT OF THEIR BOXES BUT I PRESERVED THE BOXES WELL AND ALL ARE IN GREAT CONDITION. Ending Sunday at 7:47PM BST2d 22hBrand: FunkoPackaging: Original (Opened)Size: 4"
Funko Pop Vinyl - THE WALKING DEAD - Rick Grimes #13 - BOXED AND IMMACULATE! THEY HAVE BEEN OUT OF THEIR BOXES BUT I PRESERVED THE BOXES WELL AND ALL ARE IN GREAT CONDITION. Pop The Walking Dead: Daryl Dixon's Chopper 08. Part of the rides collection. Glenn Rhee The Walking Dead Funko Pop Vinyl Red Cap #35. Condition is Used. Dispatched with Royal Mail 2nd Class Signed For. There is some damage to the right side of the box. Please look at pictures carefully before purchasing, if you require more pictures please let me know. This will be packed and shipped in a box with bubble wrap to avoid any extra damage in transit. Any questions feel free to ask! Funko Pop! Movies Dr Emmett Brown Vinyl Figure. Condition is Used. Dispatched with Royal Mail 2nd Class. Do you have one of these in your awesome collection? No! Well here's your chance. Go on, you deserve it. The Walking Dead NEGAN Funko Pop! The Walking Dead Negan Pop! Ages 17 and up. Any delays may result in the item becoming sold out and unavailable. We are not accountable for minor colour differences or minor size variations on the site. 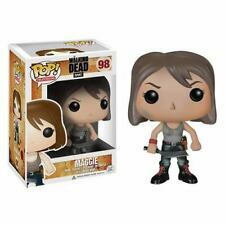 Funko Pop Vinyl - THE WALKING DEAD - Morgan #308 - BOXED AND IMMACULATE! MORGAN #308. THEY HAVE BEEN OUT OF THEIR BOXES BUT I PRESERVED THE BOXES WELL AND ALL ARE IN GREAT CONDITION. Ending Sunday at 7:45PM BST2d 22hBrand: FunkoPackaging: Original (Opened)Size: 4"
Grear condition Rick Grimes pop vinyl. Ending Saturday at 7:25PM BST1d 22hBrand: FunkoCharacter: Rick GrimesSize: 13"
Walking Dead Daryl Dixon on Chopper Pop Vinylfigure Set 12cm Funko 08. Condition is New. Dispatched with Royal Mail 2nd Class. Condition is Used. Item has previously been on display out of its box. The pop itself is in good condition, it does have 2 minor paint marks on back, shown in images. No original box. Glen (Red Cap) Funko Pop! Vinyl Figure from The Walking Dead. Very rare pop that is now Vaulted. There is a sticker mark on the box that I can’t get off, have tried to show it in the photographs. Item pictured is the item I am selling. Thank you for taking a look. Please message me with any questions. Will be sent bubble wrapped. Funko Pop Walking Dead Gabriel Pop Vinyl Figure #386. Condition is New. The Pop in the pictures is the Pop you will receive. Pop Figure will be shipped secure in appropriate sized box and bubble wrapped for protection during delivery process and marked as fragile. Will be shipped with tracking. Please be sure to leave feedback and feel free to contact me with any questions. Dispatched with Royal Mail 2nd Class. Funko Pop Vinyl - THE WALKING DEAD - Hershel Greene #153 - BOXED AND IMMACULATE! HERSHEL GREENE #153. THEY HAVE BEEN OUT OF THEIR BOXES BUT I PRESERVED THE BOXES WELL AND ALL ARE IN GREAT CONDITION. Ending Sunday at 7:50PM BST2d 22hBrand: FunkoPackaging: Original (Opened)Size: 4"
In excellent condition is this Gemini Exclusive of Bloody Maggie. The box is in great shape (no dents or creases), but it does one or two tiny flaws which are very minor. I have captured these in the photos if you want to look closely and in more detail. Funko POP The Walking Dead: Hershel Greene Vinyl 153. Perfect for collector ! Woodbury Walker Funko Pop Vinyl.The Walking Dead #101 Vaulted Rare. Funko Pop! Vinyl....Walking Dead Carol Peletier. 156. Superb condition. Vinyl.Carol Peletier from the Walking Dead. She in number 156. In superb "displayed in box" only condition. The Walking Dead - Eugene Funko Pop! If purchasing a Glow in the Dark (GTID) Funko POP! Funko No: 576. Any EXCLUSIVE Funko Pop! Rounding out the series is a new version of Negan! Shown clean shaven with a bit of blood splatter, holding his lovely Lucille. The Walking Dead - Vinyl Injured Daryl Dixon (Bloody Exclusive) - Funko Pop! Funko 11070 Pop Television The Walking Dead Negan Vinyl Figure. Condition is New. Dispatched with Royal Mail 2nd Class. Never opened. Funko striker Vinyl Figure bendy and the ink machine. Condition is New. Dispatched with Royal Mail 2nd Class. 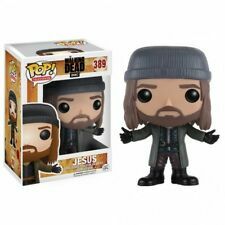 Funko Pop Vinyl - THE WALKING DEAD - Ezekiel #574 - BOXED AND IMMACULATE! EZEKIEL #574. THEY HAVE BEEN OUT OF THEIR BOXES BUT I PRESERVED THE BOXES WELL AND ALL ARE IN GREAT CONDITION. Ending Sunday at 7:46PM BST2d 22hBrand: FunkoPackaging: Original (Opened)Size: 4"
The Walking Dead Signed by actor chad coleman who playTyreese Funko Pop. 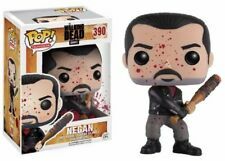 Condition is New w i t h c e r t i f i c a t e.
Funko Pop Televison The Walking Dead Negan #390 Vinyl Figure . Condition is New. Dispatched with Royal Mail 2nd Class. Number 15 in The Walking Dead series. The box has never been opened and is in excellent condition. Andre the giant funko pop. Condition is used. Please see box Mark's for yourself and judge the box accordingly. Price is considering the box damage. Dispatched with Royal Mail 2nd Class signed for. Daryl Dixon #14. They have been displayed and do have a few paint blemishes (as do most earlier pop vinyls). 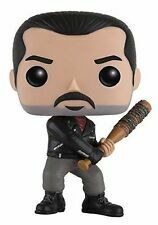 Funko Pop The Walking Dead 390 Negan Barnes & Noble Exclusive. Please note most Funko Pop! Vinyl figures and bobble heads will be perfect and unopened. Any markings or damage to any boxes will be pointed out in pictures, so please be sure to look through and check. I also have other Funko Pop! Listings. If you win/purchase more then one pop, I will invoice you for combined postage. Please pay as soon as possible to save delay on your postage. All items paid for before 22:30 will be sent next day. Items will be sent via Hermes and tracking will be provided. Prison Guard Walker Funko Pop Vinyl Figure from The Walking Dead range. Figure is sold as UNBOXED but is in good condition. It has been displayed and may have slight paint blemishes (as do most earlier pop vinyls) so please study pictures carefully before buying. Please Note - Pictures are of the actual item you receive, I have tried my best to show any faults so please study pictures carefully before purchasing. This item is in hand, in the U.K. and is ready to ship. All my pops are sent in cardboard boxes to protect during shipping. I have a few other pop vinyls available and will happily combine postage. Any questions? Please do not hesitate to ask. Thanks for looking and happy bidding. You are buying a Funko Pop Plushies. Well Zombie. The Walking Dead - Prisoner Daryl Dixon #578 (FYE) Funko Pop! Vinyl form. This version of Daryl, depicting the beloved character in his prison outfit, features the FYE Exclusive sticker. Exclusivity: FYE. The Walking Dead NEGAN BLACK & WHITE BLOOD SPLATTER Exclusive Funko Pop! This blood splattered Black & White exclusive Walking Dead Negan Pop! Complete with silver exclusive sticker. Ages 17 and up. Funko Pop Vinyl - THE WALKING DEAD - Negan #390 - BOXED AND IMMACULATE! NEGAN #390. THEY HAVE BEEN OUT OF THEIR BOXES BUT I PRESERVED THE BOXES WELL AND ALL ARE IN GREAT CONDITION. From Funko. Choose from Carl (Zombie Guts), Daryl (with Rocket Launcher), Gabriel, Jesus, Negan, or Rosita. 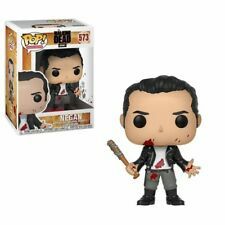 The Walking Dead - Black & White Bloody Negan Exc Funko Pop! Character: Black & White Bloody Negan.